This post is filed under Carrots, Chicken, Frozen, Lean Cuisine, Microwave, Peppers, Pineapple, Rice, Sweet And Sour. Why do you plate some microwavable meals where as others you leave in their trays? idk, i like this but i don’t taste the sweet just the sour. it’s like lemon chicken with pineapples and rice. I always have good luck with Lean Cuisine. Top Three: Fettuccine Carbonara, Some red sauce pasta with bacon, and Butternut Squash Ravioli. 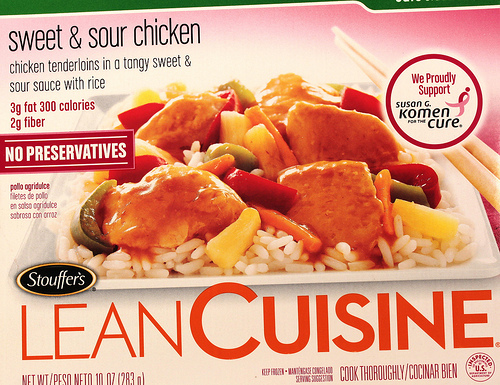 I usually buy this one when I get lean cuisines. Tastes pretty good and really sweet for being “healthy”. “Real” sweet and sour *insert_meat_here* is made with loads of vinegar, and as such is amazingly pucker-y and delicious. Considering how sensitive Americans are about vinegar, it is left out of most cheap “asian food” imitators to avoid offending people (I suppose). 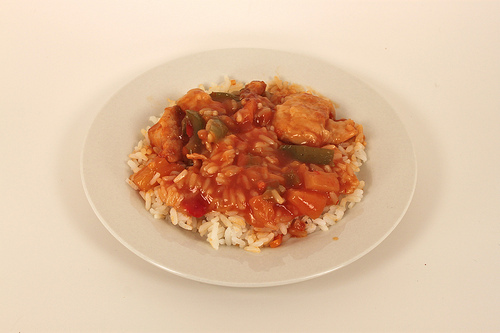 Make it at home or go to an authentic restaurant of any SE Asian or Far Eastern variety to experience the heaven on earth that is “sweet & SOUR”.